Sometimes writers raise the question, what is it that runners think about? Often the writers are looking for something beyond the inner dialogue of effort and discomfort, they’re hoping for clues to deeper meaning in the runners’ lives or even hints of spirituality. That’s fine, but why shouldn’t runners think about the act of running? Call it being “mindful,” or just paying attention to what you’re doing. I was thinking about this the other day when I heard about an emergency landing of a passenger jet which had lost an engine: the pilot was lauded for keeping her cool. A former fighter pilot, she had been taught to “exude confidence,” a practice that some attribute to legendary test pilot Chuck Yeager, who once commented that as situations became more dangerous, he would speak more slowly. This line of thought led me to conduct an experiment: I’d take some notes on my own thoughts while completing a high-intensity speed workout at the local track — an exercise that doesn’t carry the same risk as piloting a jet fighter, but which subjects the runner to high levels of discomfort and exposes him or her to heightened risk of injury. The goal of the experiment: observe how I talk to myself while running. After the first try at this experiment, however, it became clear that what was going on in my head wasn’t a monologue, but rather a conversation among several speakers — all different parts of myself, admittedly — but with specific roles. This segregation of duties, based on my military and corporate experience, seemed to help the decision-making process during the run. Perhaps others will find it useful to organize their thoughts this way. I’m a little nervous that this transcript may strike people as somewhat nerdy — but why shouldn’t I try to be as calm and collected as a fighter pilot? A lot had changed in thirty years. After a brief stint in the army, I had moved on to a career in finance. Meanwhile, the Army had deactivated the 7th Infantry Division, and Fort Ord had been transformed into a national park. I couldn’t resist. In due course, I was registered for The Ordnance 100-kilometer (61-mile) trail race, organized by Inside Trail. It would be a chance to experience once again Fort Ord’s rocky canyons, emerald hills, and sandy trails, as well as reflect on the idea of “going light,” not only as a soldier, but now as a runner. Just a few minutes before the start, eight members of Team Red White & Blue posed for the camera, dressed in red shirts emblazoned with white eagles, smiling shyly in the pre-dawn light. For most of the team, it would be their first attempt at 50 miles — a distance nearly double that of the marathon and sixteen times the 5k. 50 miles is not easy to get your head around, even if you’ve run it before. I was both a member of the team and one of the organizers of this race, called Rock The Ridge, which takes place in New York’s Hudson Valley. The race had been created to showcase the beauty of the Shawangunk Mountains, raise funds for a nature preserve that safeguards this wilderness, and encourage people to take on an endurance challenge that would be epic yet achievable. In 2013, the first year of the event, I was putting some extra markings out on the course, just as dusk was falling, when I encountered an older woman hiking up the trail, a determined look on her face. “What are you doing here?” I asked, surprised and a little curious. 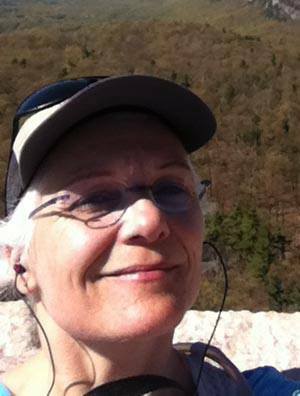 Her name was Myriam Bouchard, and she was running the 50 miles of Rock The Ridge to celebrate her 50th birthday. Then she mentioned something else: her son had enlisted in the Army and volunteered for the Special Forces, and she wanted to set an example for him. I had served in the Army many years ago and experienced my fair share of runs, road marches, and cross-country movements. Indeed the idea for Rock The Ridge came in part from military-style endurance challenges, like the Hong Kong Trailwalker. We had modeled the event specifically after President John F. Kennedy’s 1963 challenge to the US Marines: could they still march 50 miles in 20 hours, as once required by Teddy Roosevelt? JFK believed that physical and moral strength were linked. 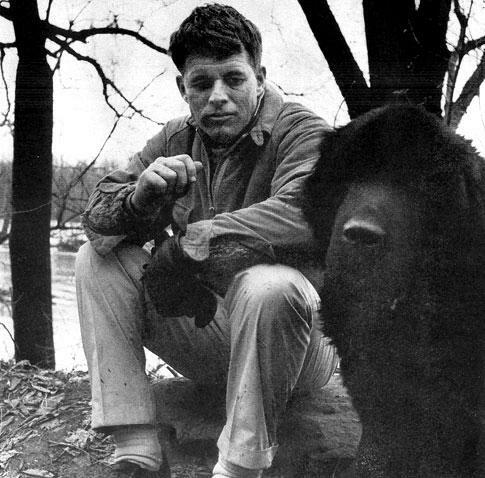 In 1960 he had written an article for Sports Illustrated entitled, “The Soft American”. The knowledge that the physical well-being of the citizen is an important foundation for the vigor and vitality of all the activities of the nation, is as old as Western civilization itself. But it is a knowledge which today, in American, we are in danger of forgetting.For physical fitness is not only one of the most important keys to a healthy body; it is the basis of dynamic and creative intellectual activity. The relationship between the soundness of the body and the activities of the mind is subtle and complex. Much is not yet understood. But we do know what the Greeks knew: that intelligence and skill can only function at the peak of their capacity when the body is healthy and strong; that hardy spirits and tough minds usually inhabit sound bodies. Nonetheless, he finished the 50 miles, in 17 hours and 50 minutes. The Kennedy Challenge attracted enormous publicity, and soon a fad for 50 mile hikes was sweeping the nation. Life Magazine devoted an entire issue to the phenomenon. Popular musicians wrote songs. The young, the old, even high school kids were on the march. Unfortunately, the mass enthusiasm for endurance challenges faded with Kennedy’s untimely death. 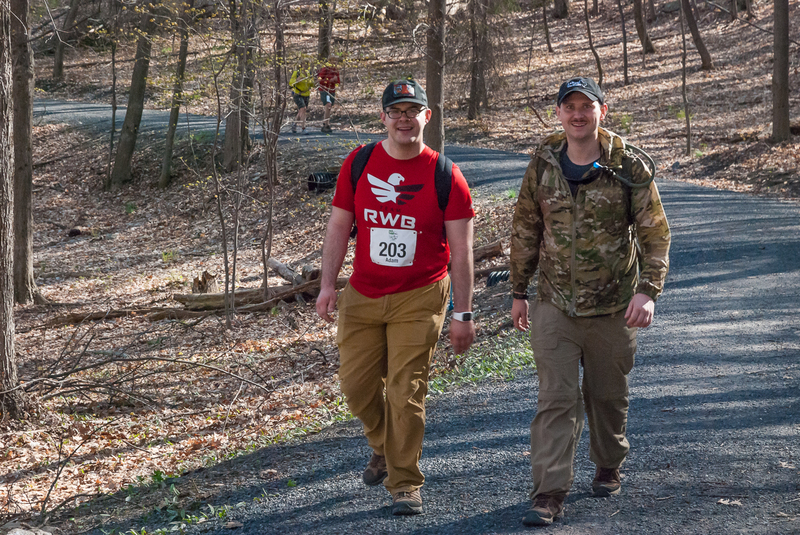 In my deep love for him, I felt if I succeeded in this 50-mile endurance race, I could pass along my determination – something to take with him when things got rough during his multiple assessments where he might be tempted to give up. If I finished, I wanted him to remember that once you set your mind on something, it’s possible to reach your goal by sticking to it. That was my hope anyhow: that I’d make it to the end so I could inspire him to move beyond his own limitations, or what he perceived as such. After reading Myriam’s words, I had a sudden vision of military personnel and civilians moving together along the mountainous trails, celebrating the spirit of endurance that is so necessary for all of life’s difficult missions. A quick internet search led me to Mike Erwin, founder of Team Red White & Blue, a not-for-profit organization whose mission is to enhance veterans’ lives through physical and social activities. After meeting Mike, I started running with a Team Red White & Blue group in Central Park on Wednesday evenings. There I met a retired military policeman named Joseph Coureur who carried the US flag during our evening runs. “Why don’t you carry the flag at Rock The Ridge?” I asked innocently. An experienced marathoner, Joseph wrote in his blog that “lately my running is less running and more exploring and accomplishing.” I kept asking until the idea of running 50 miles finally hooked him. 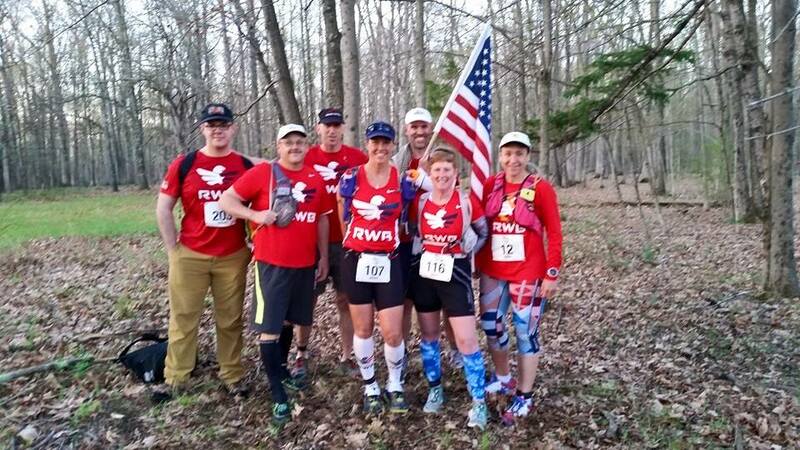 And so it came to pass that one fine morning in May 2015, among two hundred other participants, Joseph, myself, and six other members from Team Red White & Blue were standing at the start of Rock The Ridge. The sun was just peeking over the horizon. It was going to be a beautiful day. As soon as the starter’s gun went off, Team Red White & Blue members Nina DiPinto and Julie Daigle joined up with Joseph, and the three of them headed out together. They moved as a team, vigorously hiking the hills, running the flats, taking in the views across the valleys, and braving the afternoon heat. At mile 37, they pulled into one of the aid stations to regroup. Nina was suffering from bronchitis and a sinus infection, and she worried that to keep going would unfairly slow the others and potentially jeopardize them finishing. She made the difficult decision to drop out. Joseph unlaced his shoes for a few minutes and ate some soup and crackers. During the day, his emotions had ranged from denial to suffering to acceptance. Now he and Julie decided it was time to run. Julie was all smiles and sparkling eyes. Evidently indefatigable, she looked like she was ready to take on another 50 miles. Adam Freed and Phillip McIntire, who had served together with New York’s 69th Infantry Regiment, arrived at the finish line a couple of hours later. They were in high spirits, although they sheepishly admitted they needn’t have carried 30-pound packs. It’s just that as infantrymen, they were used to 50 pounds.of gear or more. Along the way, they found the blisters agonizing, and Phillip nearly dropped out at mile 43, when he felt himself “completed exhausted physically.and mentally.” But he persevered, thanks in part to Adam’s companionship and another racer who fell in with them and suddenly they found themselves exhilirated to be running on the ridge under the moonlit sky. They had plenty of experience moving on foot, but had never covered anything near to 50 miles, and certainly not on such varied terrain. This was an enormous accomplishment which Phillip reports has “redefined” his goals. Bob Harris, an experienced trail runner and former Marine, covered the distance in 9 hours 55 minutes, setting a new personal record, despite coming off a lingering injury. He credits his military training for instilling mental perseverance, flexibility to overcome unexpected setbacks, and commitment to high expectations. Bob ran much of the race with a friend; he felt “a great sense of humbleness” at his friend’s compassion and unselfishness for keeping him company at the expense of his own goals. 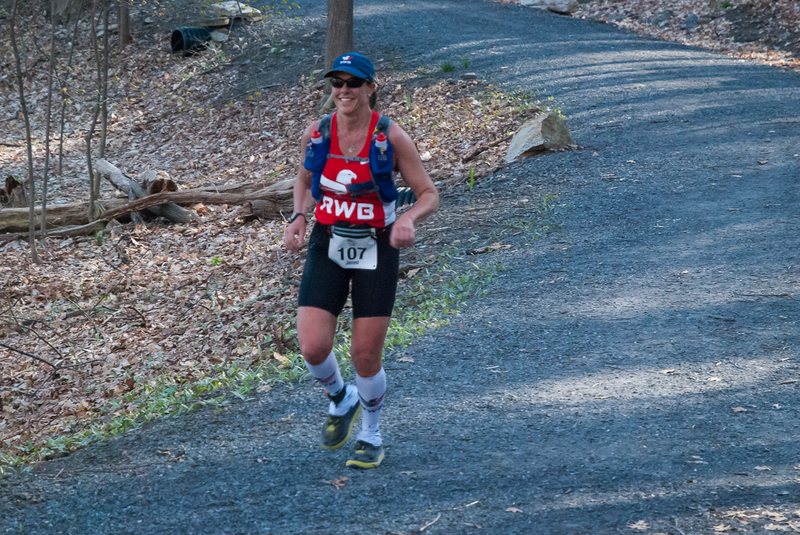 Serving on active duty with the Army in Maryland, Jenni Hollenbeck had signed up for Rock The Ridge because she’s passionate about fitness, loves trail running, and was eager to experience the Shawangunk Mountains. 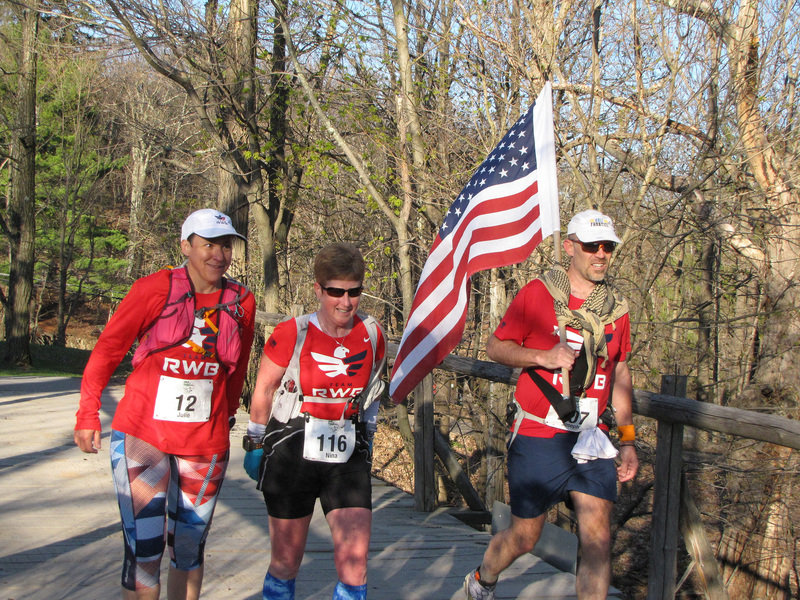 One of her goals is to spread awareness for preservation our environment at the Mohonk Preserve and areas all across the U.S. She finished the event in just under 12 hours, a model of steadiness and consistency. I managed to complete the 50 miles and was pleased with my time, although I’m an old hand at long-distance running. This year’s Rock The Ridge was my 62nd race of marathon distance or longer. For each of us, the race had been a different mix of highs and lows and included lessons in focus, determination, and teamwork that we might be able to apply to important real-world goals. I’d like to think JFK would have approved of our performance. A few days after the race was over, I re-read Myriam’s blog. Her words reminded me that the real world can pose challenges much tougher than running 50 miles. Perhaps joining the Special Forces, providing he did make it through the selection process, could be the best thing that happened to him. Perhaps, it could be the worst. I couldn’t fathom losing my son to battle. Every cell of my body, as a mother and pacifist, screamed “No!” The fear of loss was unbearable. So, I’d go work out and I’d cry. Before Rock The Ridge, Myriam had never run more than 10 miles. She trained intensely for three months and completed the 50 miles in just over 15 hours. She tells me her son has made it through the first level of Special Forces training although he still faces a long road. To make it this far, he must be a determined young man. I think I know where he gets his spirit. 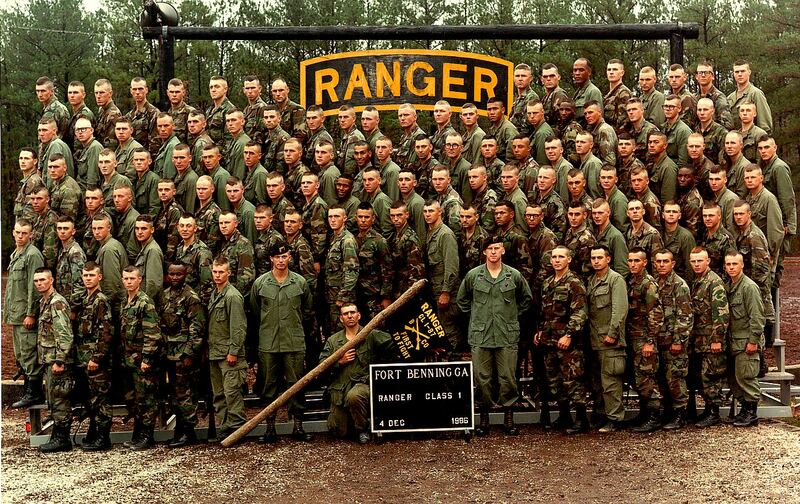 A long time ago, I was a U.S. Army Ranger. It was just about the toughest thing I ever did. Honestly, I wasn’t very good; my path ended up taking me to Wall Street, which was a better fit for my skills. But I’m proud to have served my country as best I could, and I remain very impressed with the caliber of people I encountered in the Army then and today. Violence of Action: The Untold Stories of the 75th Ranger Regiment in the War on Terror, consists of a series of first-person accounts told by Rangers who fought in Iraq and Afghanistan. I recently met two of the co-authors, Charlie Faint and Marty Skovlund Jr. 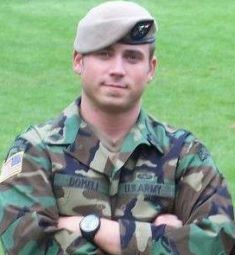 Most of the stories were about combat operations, but the story that caught my attention was that of Scoti Springfield Domeji, the mother of Sergeant First Class Kristoffer Domeji, a highly regarded member of the 2nd Ranger Battalion. Growing up, Spartan girls ran, wrestled, and trained, just like the boys. As mothers, they expected their sons to fight and win. If they died in battle, that was a cause for celebration, not sorrow, because that was the purpose for which they had been raised. The injured or defeated were not welcomed home. Spartans are a minority in modern America. Like me, Scoti grew up during the 1970s, a time when soldiers returning from the Vietnam War were treated poorly. We both remember the feelings of tension and divisiveness. I wanted my sons to learn that failure is success in disguise. I never allowed two sayings in my home: “I don’t know how” and “I can’t.” I taught the boys to say, “I’ll try.” I didn’t care if they failed, but I expected them to try. When Kristoffer asked permission to enlist, she was reluctant to sign the paperwork. She acknowledges that deep down, she was thinking, “If you’re killed, I’ll feel guilty.” But she did sign, and he enlisted in the Army and volunteered for the Rangers. Like any mom, she worried. She may have been a “lioness single mom,” as her friends called her. But she recognized that her “cub” had grown into a “full-fledged lion.” Even so, she instinctively yearned to take care of him. On October 21st at 11: 30 pm, she received unexpected visitors. “Who’s knocking on my door?” I spoke aloud. My surprise at the sudden banging on my front door near midnight gave way to annoyance. “Probably someone with car trouble. If I ignore the knocking they’ll go away.” The insistent pounding on my door continued for fifteen minutes. I finally walked down my stairs and opened the door. Two tall men in military uniforms stood on my front steps. Even as time went by, Scoti continued to feel the loss of her son sharply. I still fly blind trying to navigate turbulent ups-and-downs of mourning. Unpredictable emotional loops, rolls, and spirals send me crashing. I burn with longing for my son to still be alive. I’ve lost all power to reclaim before-my-son-died “normal” or to control after-death’s sting. Sometimes, the emotional pain overwhelms my physical strength. With immense effort, I urge myself forward. Just take one step, one more step. What could a runner learn from Scoti? Something about the spirit that keeps you moving forward, one step after another, no matter how bad you feel, whether it’s the last quarter mile of a 5k, the last five miles of a 350-mile ultra-marathon, or some challenge or loss in the real world. Theodore Roosevelt once said, “Black care rarely sits behind a rider whose pace is fast enough.” In other words, keep moving. I wonder how those Spartan moms really felt. Thank you for sharing your story, Scoti.